Windows 10 has an awful lot of options in its new Settings app, but from time to time, you may encounter a setting that’s grayed out, with the message “disabled by company policy” or “Some settings are managed by your organization”. Here are a few reasons that may be happening. 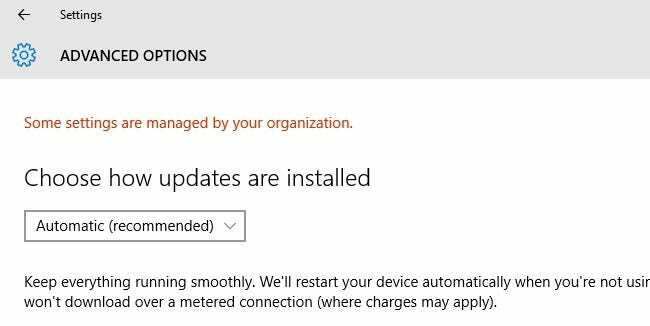 Many of Windows 10’s settings are intertwined, which means for one setting to work, you may need another enabled first. If that requisite setting isn’t enabled, you may get one of these cryptic error messages. Cortana is a popular victim. 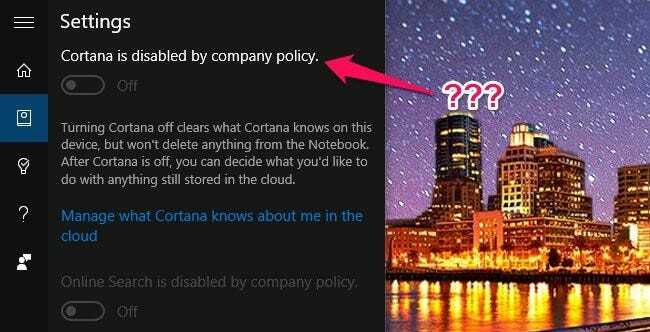 You may see a message that “Cortana is disabled by company policy”, even if your computer is not managed by a company. Talk about a horribly vague error message! In our research, this can be caused by a number of different things. If you have a corporate Exchange account configured in the Mail app–perhaps a work or school account–it may not allow Cortana to be used. To fix this, remove your email account from the Mail app, and see if you can enable Cortana. According to Reddit user theshadowsays, you can re-add the account and use Cortana as long as you select “No” when asked to use that account for other services. If that isn’t the case, you may have the wrong language or region settings. To fix this, go to Settings > Time & Language > Region & Language. Make sure your “Country or region” setting is correct, and that you have the correct language listed under “Languages”. You may need to click on the language and choose “Set as default”. If it is not in the list, add it with the “Add a language” button. Lastly, head to the “Speech” tab and ensure your “Speech language” is set to the same language as the other settings. And, of course, make sure Cortana is available in your region in the first place. With any luck, you should be able to turn Cortana on once you change these settings. If not, continue to the section below. Both the Cortana error and the “managed by your organization” message can often appear if you’ve altered your settings for Microsoft’s Telemetry program. Some features require this to be set to “Enhanced” or “Full” to work properly. To change this, open the Settings app and head to Privacy > Feedback & diagnostics. Under “Diagnostic and usage data”, select “Enhanced” instead of “Basic”. If that box is grayed out, there is a larger issue at play: you (or someone else) has set this feature to “0 – Security”, using the Registry or some other back-channel method. 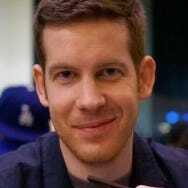 When that happens, Telemetry is turned off entirely, and some features will no longer be available–such as the ability to download Insider Preview builds. If you have previously turned this setting off–either through the Registry, Group Policy Editor (on Windows 10 Pro), or with a “privacy” app, change it back to Basic or Enhanced, and the “managed by your organization” message should go away. In general, we do not recommend these Windows 10 privacy apps–they cause more problems than they solve. Instead, you should get to know Windows’ privacy settings yourself, and set them according to your needs and wants. You’re likely to encounter fewer issues this way. Of course, if you’re willing to go without those features for the peace of mind these settings bring, feel free to keep it where it is. Just know that some things may break or be grayed out. These are some of the error messages we’ve run into in our time with Windows 10, but if you see one of the above messages–and our suggestions don’t solve your problem–let us know in our forums below, and we’ll be sure to keep this article updated with all the solutions we find.